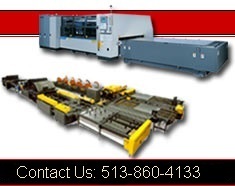 CINCINNATI Precision Machinery Inc. Is A Full Service Distributor Of Sheet Metal Equipment. If You Are Looking For Sheet Metal Machinery In Ohio, Kentucky, Indiana, Missouri, Kansas, Nebraska or Illinois - We Can Help You With Everything From Sheet Metal Hand Tools To High Precision Cutting Lasers And Sheet Metal Coil Processing Coil Lines. HVAC , roofing and sign Companies - CPM offers a variety of sheet metal fabricating equipment- we supply your hVAC, Roofing or sign company with all of your sheet metal cutting machinery . Precision Machinery - CINCINNATI Precision machinery offers a wide variety of fabrication equipment for your precision metal fabrication needs. Upcoming Events - click here to see whats going on in the world of sheet metal. About Us - Learn More about cINCINNATI Precision machinery and the products we represent. *Information And Prices On This Webite Are Subject To Change Without Notice. *Offers From CINCINNATI Precision Machinery Include Terms And Conditions Which Are Provided With Your Quote. *Liability Is Strictly Limited To Those Warranties Of Fitness For Purpose And Safety As Provided By The Manufacturer. *Products And Logos In This Website Are Trademarks Or Registered Trademarks Of Their Respective Companies Or Mark Holders.